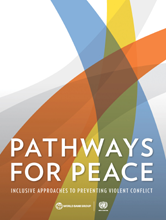 Grounded in a shared commitment to this agenda, Pathways for Peace: Inclusive Approaches to Preventing Violent Conflict is a joint United Nations and World Bank study that looks at how development processes can better interact with diplomacy and mediation, security and other tools to prevent conflict from becoming violent. Why, Then, Is There So Little Belief in the Prevention of Violent Conflict? What Is the Prevention of Violent Conflict? Can Prevention of Violent Conflict Be Done Differently?